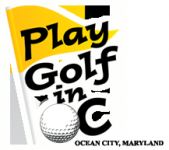 Ocean City Golf Getaway is pleased to provide you with one stop hassle free shopping for your golfing vacation. Offering varieties of all inclusive service oriented packages with hotels, golf package companies, condominiums, restaurants, golf schools and courses, and entertainment. Pam's OC Golf Getaways has 22 years of experience getting golfers the perfect tee times, the sweetest course deals and the largest selection of accommodations. Harrison Group has been a growing family-owned business in Ocean City, Maryland, since 1951 that includes ten oceanfront hotels, three renowned restaurants and offers popular "Golf Packages". Blue Water Golf Pro, formerly 19th Hole Golf Getaway, and Golf Pro Josh Esworthy are ready to help you plan your next Ocean City golf trip. We can arrange your transportation to and from our famous resort town, secure your tee times at the most popular courses, ensure that your condo accommodations are comfortable and clean, and recommend and reserve your seating at the city's most popular restaurants and nightclubs. We own and operate all of our hotels to ensure clean and comfortable accommodations with no additional booking fees. Choose from 3 oceanfront Boardwalk hotels with various room types to fit your budget. From rooms and suites to efficiencies and studios. Genesis Golf Trips is a golf tour operator focusing on destinations that reside within the Mid-Atlantic: throughout Pennsylvania, Maryland, Delaware and Virginia. We even offer Myrtle Beach for existing customers wanting to do comparisons and still travel further south. Play Golf in OC is dedicated to customer service and providing the best value at the beach. We offer specialty packages, personalized customer service, many hotel amenities and top-notch accommodations! Copyright © 2019 Ocean City Golf Club.